After five or so years of gestation, the graphic novel that was once titled Holy Terror, Batman! is finally in stores. Was it worth the wait? Goodness, no. Even though Holy Terror was conceived as an uncompromising propaganda piece by The Dark Knight Returns author Frank Miller, it fails even at that incredibly basic task. This book doesn't titillate or drum up righteous rage. 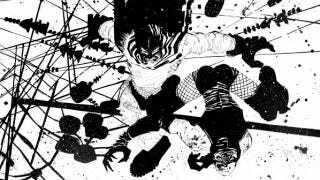 All it does is remind us of how good Frank Miller used to be. When Holy Terror, Batman! was first announced, the high-concept selling point was Batman clobbering Osama bin Laden with a right hook. Readers were promised a throwback to World War II, when Captain America would sock Hitler and everyone would cheer their lungs out. Back then, it was unclear if HTB! would be self-aware kitsch, pure polemic, or at least an acknowledgement of the historical tradition of superheroes intervening in real-world conflicts. Holy Terror, Batman! was supposed to be crafted under the aegis of DC editor Bob Schreck, but Schreck was laid off from DC and became the editor-in-chief of Legendary Comics. Miller followed Schreck, and HTB! was forced to jettison its Battiness. Not that this change of imprint mattered. For all intents and purposes, this is a Batman story — you just need to use your imagination. For example, "The Fixer" is the goddamn Batman from All-Star Batman and Robin and "Natalie Stack" is Catwoman — it's the reader's job to picture the little triangles above their heads. Similarly, "Dan Donegal" is "Jim Gordon" and "Empire City" is Gotham. Given that these are DC characters with pseudonyms, Miller doesn't bother with characterization. He also tosses in a Mossad mercenary and two ninja assassins (shades of Miho from Sin City, Miller even pens a metatextual throwaway line acknowledging this link). This is familiar territory for Miller. It's so familiar that it feels recycled. The opening make-out session between the Fixer and Natalie feels cribbed from All-Star Batman and Robin. Miller's depiction of Al-Qaeda is so cartoonish — razor blade bombs and corrupt police commissioners! — that it could be any one of the shadowy cabals from Sin City. This fictionalization of Al-Qaeda guts Holy Terror of any emotional resonance. Miller doesn't depict the terrorists as any real-world threat. No, they're James Bond villains who happen to yell "Jihad!" a lot. The goofiness of the villains makes the Fixer a piss-poor avatar for revenge — you might as well be cheering him on as he fights COBRA or Goldfinger's henchmen. The artwork further chips away at any propaganda value. Remember, this is a city drawn by late Frank Miller, so expect characters with fists the size of fax machines jumping through inkblots and chiaroscuro rainstorms. It's an intentionally muddled, scritchy-scratchy book. I guess Miller was attempting to depict the firsthand chaos of a terrorist attack, but barring a panel in which an ersatz Statue of Liberty is knocked over, the reader has no clue what's happening spatially. It's hard to be terrorized by black-and-white geometry blowing up. The thing is, Miller can draw cities. Anyone who's read his run on Daredevil knows this. And Frank Miller has written good comics, so why he chose to write an incoherent superhero story that equates Islam wholesale with terrorism and (literally) underground secret societies is beyond me. Holy Terror could have succeeded as either a punch drunk, sarcastic update of World War II propaganda comics or a superhero conspiracy tale in the vein of Sin City. Instead, Miller's mixed the two and thrown in a stinking dollop of "war of civilizations" rhetoric. Insultingly priced ($30 for a plotless wafer of a graphic novel), ideologically troglodytic, and way less fun than Ronnie James Dio's "Holy Diver," Holy Terror is a goddamn mess.